Arrive in the Thai capital, Bangkok, with the remainder of the day free at leisure. Vibrant Bangkok ranks as one of the world’s top tourist destinations, popular for its street food, shopping, nightlife and inherent Buddhist culture. The following day, explore two of the city’s most historic, stand-out buildings. The Grand Palace is regarded as the most spectacular of all Thai monuments. Wander through the extensive palace grounds, incorporating more than 100 buildings, including the Royal Residence and Throne Halls. The most important, Wat Phra Kaew, is home to the Emerald Buddha, Thailand’s most revered image. 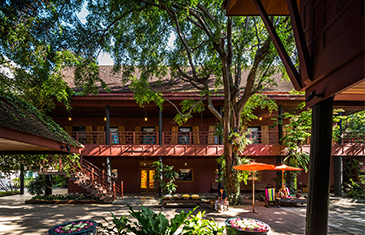 Continue to Jim Thompson House, a museum dedicated to the legendary American businessman. Known as the “Thai Silk King”, Thompson dedicated over 30 years reviving the Thai silk industry. This canal-side museum is also Thompson’s former teak wood residence, filled with his private art collections. Meet one of the last remaining, original families who produced silk under Thompson and continue to do so today. Meet with an art historian, who will guide us through Bangkok’s labyrinth of narrow lane ways to view a fascinating series of urban murals. Our guide lends expert analysis to these striking murals, depicting anything from religious beliefs and royal customs to day-to-day scenes in bygone times. Continue to an artist community along the scenic canals in the bustling Thonburi district. We visit the Artist House at Khlong Bang Luang, housed in a restored 200-year-old teak wood dwelling originating from the Ayutthaya-era. At this grassroots arts and creative hub, learn about traditional Thai painting from a skilled artist and tour the workshop. Under instruction from artists, try your hand at rudimentary Thai-style drawing patterns. Positioned in the middle of Bangkok’s Chao Praya River, just a few minutes from central Bangkok, the man-made island of Koh Kred still emits an authentic rural feel. On this timeless and peaceful island, there are no roads for cars. We first make a stop at the local market, sampling exotic Thai snacks. Continue to a pottery house, where we discover exquisite examples of traditional Thai Mon ceramics. Our final stop is at a local family home, where are taught how to make “kanom krok”, a delicious coconut-based snack, baked traditionally in a terracotta stove. 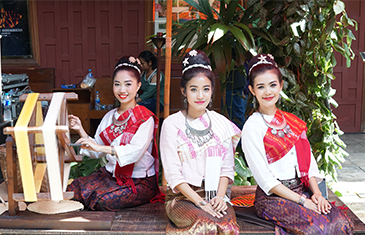 Fly to Chiang Mai, northern Thailand’s cultural capital and former seat of the ancient Lanna Kingdom. Surrounded by jungle-draped mountains and peaceful countryside, this “Rose of the North” city seamlessly combines rich ancient history and traditions with an increasingly modern side. Chiang Mai has also garnered a well-deserved reputation as a foodie paradise for its outstanding northern Thai cuisine, which remains true to its traditional roots and intense flavours. After dusk, explore Chiang Mai’s famed street food scene. On a guided food tour, sample regional delicacies from vibrant food stalls and old shophouses that surround the Three Kings Monument, near the town centre. After dark, The Monument’s square is a favourite promenade spot for local families and residents. Thailand’s northern regions and Chiang Mai boast a rich history of artisanal traditions and indigenous craftsmanship that have developed over the centuries. The city is also home to an active community of artists and crafts people and has recently been declared a UNESCO Creative City for Crafts and Folk Arts. Over the last three decades, art historian Patricia Cheesman has played a significant role in revitalising the Thai art of hand-made textiles and is a renowned expert on northern Laos and Thai textiles. We attend a full-day workshop at her studio – an ideal place to learn about natural weaving, dying and textile design. The day starts with an introduction to Lao and Thai textiles, followed by personal instruction on distinctive Japanese Shibori and natural dyeing techniques. Try your hand at hand-dyeing a textile piece. As Thailand’s main handicrafts epicentre, Chiang Mai is home to numerous cottage factories and workshops. We visit several artisan communities beyond the city, that specialise in a variety of crafts. These include silk weaving in San Kamphaeng District, Thai paper umbrella-making in Bor Sang Village and a workshop that produces Thai ceramics using centuries-old “Sawankhalok” ceramic techniques. Later, we visit Pa-Da Cotton Textile Museum, where traditional cotton dyeing and hand-weaving techniques are preserved, celebrated and showcased. Uniquely, hand-made cotton fabrics in many designs are still produced in traditional fashion by local women, woven with handlooms and spinning wheels and with yarns dyed with natural herbal colours. The museum was once the summer residence of a former Chiang Mai ruler. Chiang Mai National Museum is a primary caretaker of northern Thai history and culture, focused on the ancient Lanna kingdom and artifacts. As a research centre, the acclaimed museum offers educational opportunities to understand Lanna art and history. We join Emeritus Professor Pongdej Chaiyakut, a former Dean of Chiang Mai University, for an exclusive private tour of the museum, gaining an unparalleled understanding of Chiang Mai’s ancient and modern arts scene. Later, at Boonpratana House, experience first-hand Thai’s culinary traditions passed down the generations. Learn how to make several home-cooked recipes that can be re-created once home, besides picking-up some authentic Thai cooking tips.